We've created a tool that makes the process of creating and publishing longreads simple and easy. You don't need any technical knowledge or special skills to start using Tilda. Each design block is good as it is but at the same time you can change individual designs thanks to special settings. You don't need to learn because our interface is so easy to use. All pages created in Tilda will look equally good on all devices. At the end of 2012, on the wave of iPad's popularity, editorial teams began to rethink the future of the readers' experience. 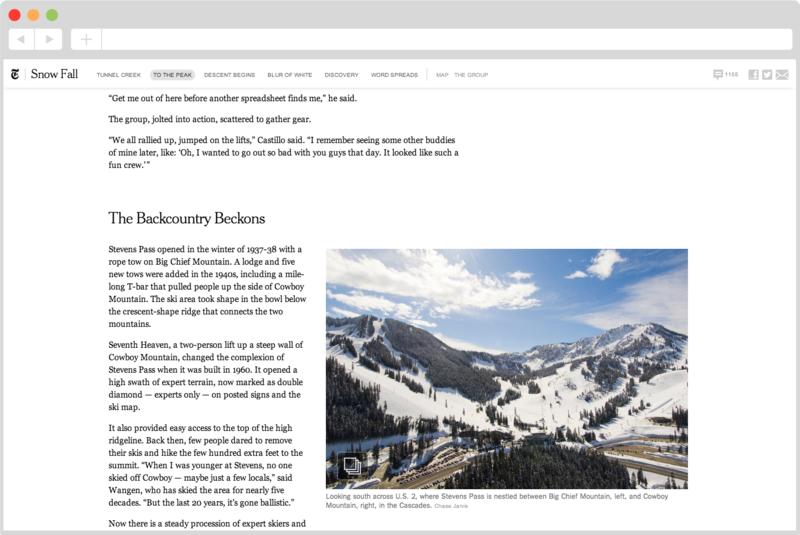 Many newsrooms were experimenting with new formats designed for the iPad. 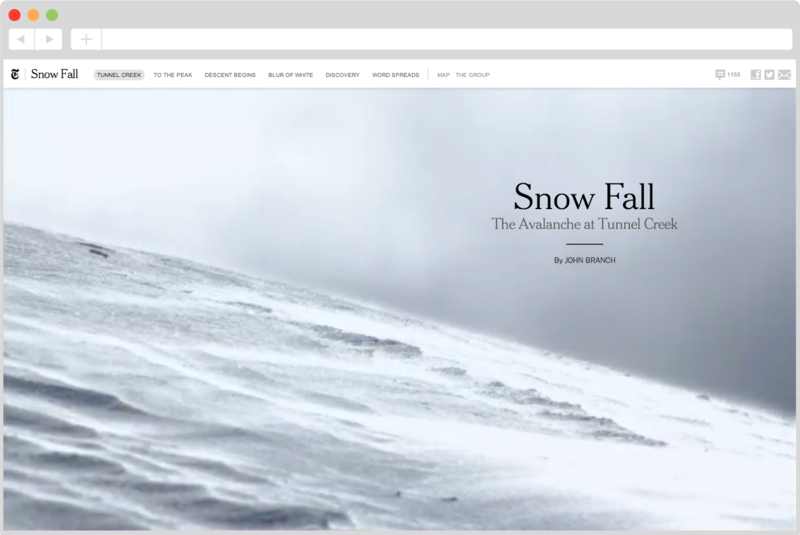 The most successful of them was an interactive story called Snowfall from The New York Times. 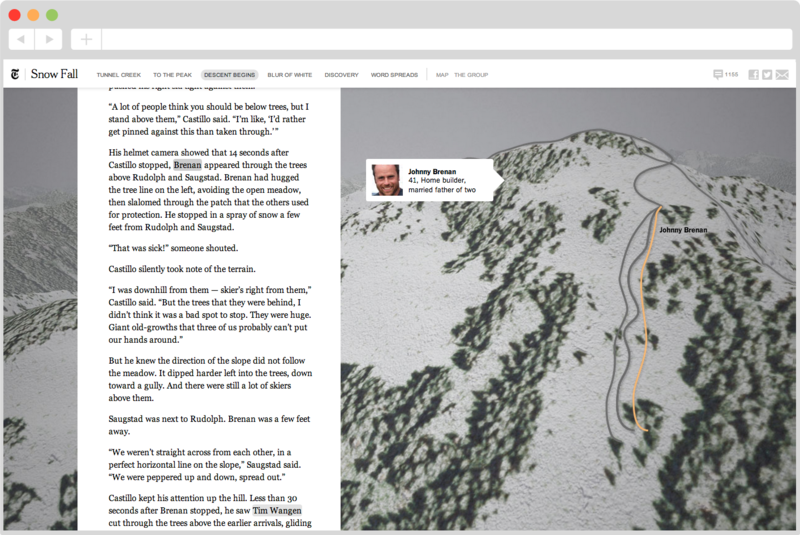 By combining infographics and animations with text, NYT has created a new standard for content presentation. It turns facts into a story, gives it character and emotions. Nobody will remain indifferent. At first, online texts were published similar to a print magazine: text was placed on the page, cut into paragraphs and supplemeted by several photos. When editorial offices realised that nodoy had the time to work their way through long unedited texts, they switched to small news items. As social networks appeared in our lives, information noise around us has increased to such as extent that we had to learn how to filter the incoming informaiton. The way we read has changed a lot but we still want to read. 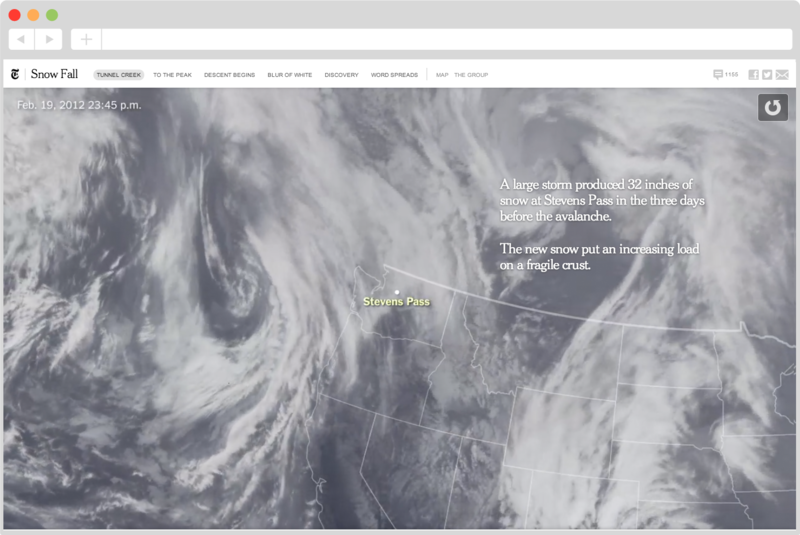 Today's journalism has new standards united under the umbrella called Visual Storytelling. Contrary to popular belief that short information shots are the format of the future, longreads are steadily gaining new readers. Well-designed, meaningful content is always has value. Research confirms that 2,000-word articles are 1,5 times more popular than short ones. When skimming a page, we pay attention to images and captions, and visual storytelling was made just for that. When visual accents are arranged in the best way, this allows the reader to absorb information quickly and easily. People like to share content if it touched them in some way. A good article not only uncovers the topic but gives it emotional colouring so that the reader wants to be involved in it and share it with others. This is a way for the readers to express themselves. Storytelling allows you to not only learn something but experience it yourself: video, audio, typography and animation create an atmosphere and allow you to receive a fully immersive experience by reading a story. Tilda has a number of wonderful templates for professional editorial content. Find the one that best suits your needs and start publishing content today. Tilda is an advanced platform with a huge number of capabilities that will make publishing your content faster and easier. It will take you a minute to make any changes: you don't need to wait for an admin, simply correct the error in the web editor. The updated page will be instantly synchronised via ftp. Tilda does not require integration with CMS. When you create an article, upload the content to your site using ftp or download it to the .zip archive. No need to worry about the safety of your files. This means you are not chained to Tilda for life. Our blocks are designed to look good across all devices. 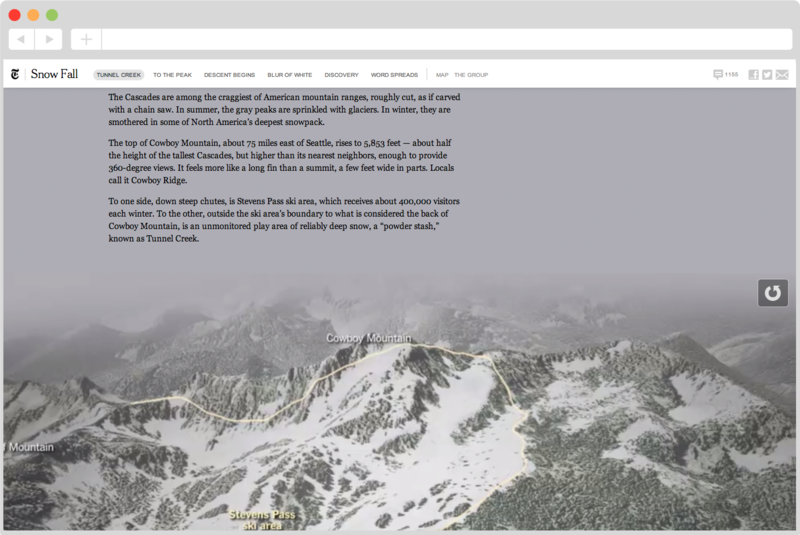 Create an article on your desktop, and it will look just as good on iPads and smartphones. It is easy to adapt Tilda to suit your style. It supports Typekit and Google Fonts so you can use the fonts you are used to. We watch the trends so you can enjoy the latest design developments. Usually, designing a great article requires many specialists. It takes a lot of time, and the project becomes too expensive and consumes too many resources. With Tilda, editors do not need professional designers to help them design an article. All our templates are ready-made. Simply choose the one you need and add content. Below are a few examples of creating content with Tilda.